A flood of counterfeit notes from Dubai, Pakistan, Jammu and Kashmir, Nepal, Bangladesh, and to some extent from Sri Lanka have left Indians swimming in a pool of devalued rupees. The fake Indian currency note crisis is benefiting terrorist organizations such as Hizbul Mujahideen and Dawood Ibrahim’s D-Gang with backing from the Pakistani ISI spy service. Profits from counterfeiting help militants buy weapons. NEW DELHI: The National Investigation Agency (NIA) has filed charge sheet against three more persons, including a Bangladeshi national, for allegedly raising terror fund for the banned outfit Hizbul Mujahideen (HM) through circulation of fake Indian currency notes (FICN) in Jammu & Kashmir. The charge sheet against the three accused Badal Sheikh and Fayaz Ahmed (both Indians) and Shafiq-ul (Bangladeshi) was filed in the NIA Special Court in Jammu under various sections of the Ranbir Penal Code and the central anti-terror Act on Wednesday. The Court subsequently issued a non-bailable warrant against absconding Shafiq-ul who was key point person of the Indian accused for supplying FICN through a trans-border cattle smuggler – Badal Sheikh — of West Bengal’s Malda district. Earlier, the probe agency had filed charge sheet against five persons in the case, alleging that the accused used to procure and supply high quality FICN from Bangladesh and smuggle it into Jammu & Kashmir for raising funds for the terror group. The five who were charge sheeted earlier include two HM members – Mubarak Ahmed Bhat and Shafaqat Mohiudding Kuchey – and Badal Sheikh. The NIA in its charge sheet claimed that HM operatives had first contacted Badal who, in turn, approached the Bangladeshi national for procurement of FICN. “Fayaz Ahmed Rather – a notorious FICN smuggler – started getting high quality fake Indian currency notes from Malda and circulate it in Jammu & Kashmir,” said the NIA. It’s interesting to note the cattle rustling connection in this story. The black market in cows, which are revered and illegal to export from India, is a growing area for illicit trade along the border of India and Bangladesh. Further evidence of Pakistani counterfeiting of Indian currency to support Islamic terrorist operations has come to light. The latest news from India’s National Investigation Agency (NIA) also implicates Dubai (UAE) as a conduit for the funny money on its route from Karachi back through the Gulf, then on to Kerala in India for distribution to jihadists. Islamic law permits theft against “disbelievers” and does not accept the legitimacy of infidel paper currencies, which legitimizes counterfeiting as a jihadist tactic. The NIA has identified the main culprit behind the smuggling of Pakistan-manufactured counterfeit “Indian” currency notes into Kerala. The agency has also reportedly found that the counterfeit currencies were smuggled into Kerala to help Jihadi operations in the State. The kingpin of the operation was identified as one Aboobacker of Kanhangad in Kasaragod district and the NIA has found him to be residing presently in Dubai. The agency is likely to send a team to Dubai for further investigations. The case had started with the confiscation of counterfeit currencies “worth” Rs 8,96,000 from Thalipparamba, Kannur on September 11. The agency, which on Tuesday submitted its preliminary probe report in the Special CBI Court (designated NIA court) in Kochi, included two more persons – Aboobacker, also brother of second accused Kamal Haji, and Muthuvankattil Shanavas of Thrissur – as accused in the case. The NIA has found that the counterfeit currencies, manufactured in Pakistan, were smuggled first into Dubai from Karachi port in containers and then rerouted to Kerala by air. The agency’s information is that such currencies “worth” crores of rupees have been smuggled into Kerala for helping Jihadi operations. The agency has also learned that first accused Pradeep Kumar and Kamal Haji had gone abroad to examine the “quality” of the counterfeit currencies. The NIA had taken over the investigation of the case after doubts were aired about its possible connections to extremist operations. Counterfeiting “infidel” currencies has become a common tactic among jihadist groups. It has, for example, reached crisis proportions against the “Hindu” rupee. Ma’an (Arabic) reports that Hamas has arrested people who were counterfeiting American $100 bills in Gaza. They caught over $200,000 of fake currency. The counterfeiters’ tool? An HP 5550 color laser printer. Hamas has good reason to arrest the counterfeiters. After all, they want to make sure that they corner the market for themselves. In her book, Funding Evil, Rachel Ehrenfeld described counterfeiting of Israeli shekels by terrorists in the Palestinian territories: “[I]n April 2002 the IDF found ‘large quantities’ of counterfeit Israeli currency in denominations of 50-, 100-, and 200-sheqel notes, in Arafat’s compound in Ramallah” (p. 91 in the paperback edition). Ehrenfeld also writes that Argentinian police alleged that Latin American based Hezbollah operative Assad Muhammad Barakat “had distributed $60 million in Colombian-printed counterfeit U.S. dollars, and that he had participated in the 1994 bombing of the Jewish Community Center in Buenos Aires…” (p. 150). The lessons that the enemies of Israel have learned is that if we don’t give you enough millions of dollars in foreign aid, just Xerox your own! WASHINGTON: India faces an increasing inflow of counterfeit currency, produced primarily in Pakistan, and terrorist and criminal networks use this money to finance their activities in the country, an official US report has said. “India faces an increasing inflow of high-quality counterfeit currency, which is produced primarily in Pakistan but smuggled to India through multiple international routes,” said the 2011 International Narcotics Control Strategy Report of the State Department. “Criminal networks exchange counterfeit currency for genuine notes, which not only facilitates money laundering, but also represents a threat to the Indian economy,” it said. Tax avoidance and the proceeds of economic crimes (including fraud, cyber crime and identity theft) are still the mainstay of money launderers in India, but laundered funds are also derived from human and narcotics trafficking, transnational organised crime, illegal trade, particularly in endangered wildlife and illegal gems (principally diamonds), and corruption, the report said. The rest of the article describes the State Department’s recommendations for the Indian government which you can read here. Even as the government of India speaks of taking preventive measures to curb the menace of fake currency, statistics show there is nearly Rs 12,00,000 crore worth of fake currency still in circulation in India. 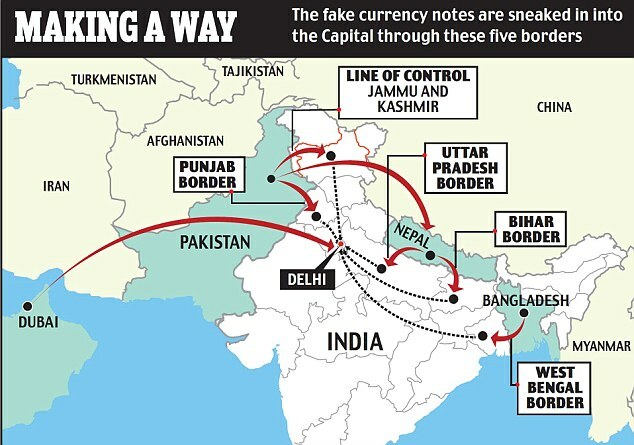 While India managed to seal the fake currency’s Pakistan and Nepal route into India to a large extent, Inter Services Intelligence-sponsored operatives have furthered their activities by shifting base to Thailand. These elements have been pumping in fake currency into the Indian market with help of operatives of the Dawood gang who have a strong base in Thailand. The key player in this racket today is Aftab Bhakti, a D Gang operative who reports directly to Major Ali and Arshad Khan, both top ranking ISI officers. Bhakti grew in stature, as he had been operating out of Thailand for nearly a decade. During his earlier stint, he coordinated with the mafia in Thailand on behalf of the D-gang. They were primarily into smuggling of drugs. The D gang’s network is very deep-rooted in Thailand and there was already an existing route between this country and Bangladesh through which drugs were being smuggled. 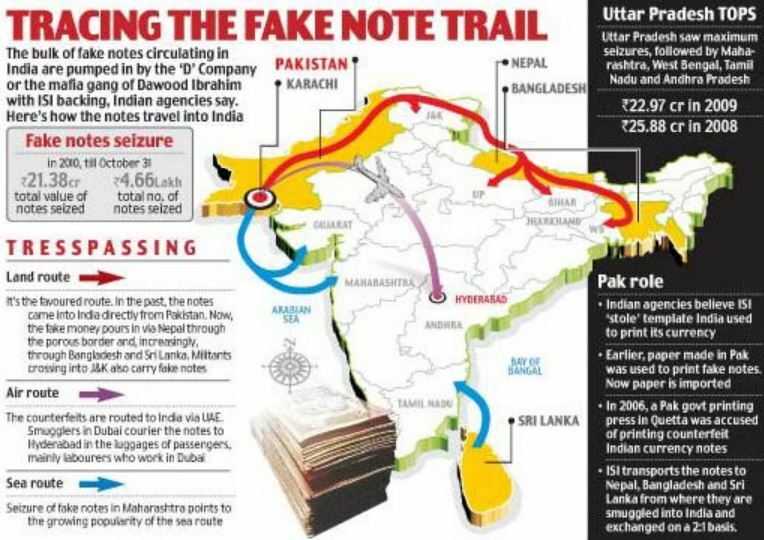 Moreover, as this particular route was not on the radar of the Indian agencies, the ISI thought it would be best to use this route to transport fake currency as well. Earlier, all notes were being printed in Pakistan and then transported into India through Nepal. However, the scenario changed post the November 26 attacks on Mumbai, which prompted the ISI to rethink its strategy. In the current scenario, the notes are being printed in Thailand and then local operatives pump it in to India via Bangladesh.